Alter The Press! : Hayley Williams Joins Fall Out Boy On Stage To Perform "Sugar, We're Going Down"
Hayley Williams Joins Fall Out Boy On Stage To Perform "Sugar, We're Going Down"
Hayley Williams joined Fall Out Boy on stage last night (January 28th) in Brooklyn, NY to perform "Sugar, We're Going Down." 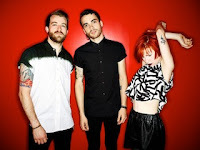 You can watch the band's performance with the Paramore vocalist below. Don't forget, Paramore and Fall Out Boy will be touring across the country this summer. Dates and ticket information can be found here.